Spinster Addy Coblentz fears she'll never marry. So her parents hire the new matchmaker who's moved to their Amish community of Seven Poplars. But Addy doesn't just want a match. She wants love. While some of her potential suitors are perfectly fine, only one man catches her eye. Gideon Esch is everything Addy's looking for: strong, kind—and handsome. But he's only a poor hired hand who can never give her family the stability they want. With her future happiness at stake, will Addy follow the rules…or follow her heart? I liked the twists in this book. 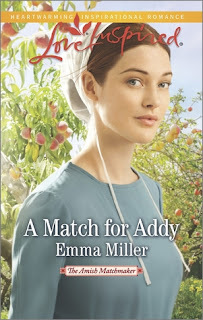 While Addy wants her own family, she is horrified that her parents hired the matchmaker to help her, especially when she is attracted to newcomer Gideon. She has lots of people giving her advice and trying to refine her rougher edges. I had a hard time with her mother who is sharp and seems to be acting in self-interest when she insists Addy marry for wealth so they will be taken care of in their old age. Gideon's thoughts are funny as he doesn't think he's ready to settle down or find a bride... until Addy slowly gets under his skin. They are sweet and fun together, even in their hard moments. A well-rounded story with a nice ending.